If you have never been you should! It’s a FREE day out and a wonderful way to keep the kids entertained. Fifteen lucky forests have been joined by a giant wooden Gruffalo. 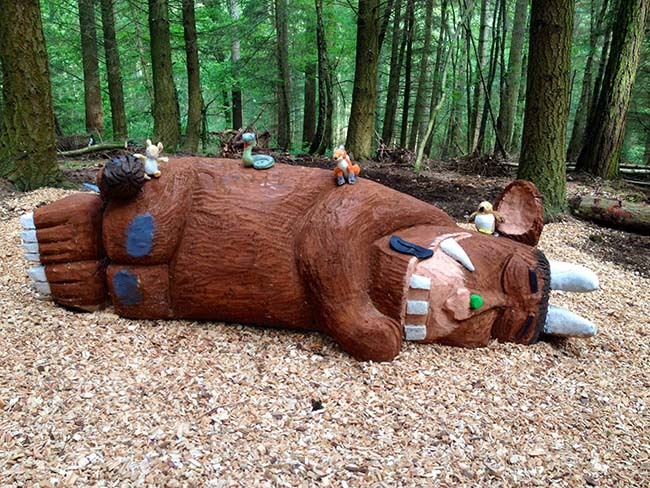 Each Gruffalo has been carved in a different position – the one at Wyre Forest is fast asleep! What is The Gruffalo Trail? A series of self led activity trails across 15 locations at the Forestry Commission. Characters from the stories will lead children through the forest with adventure and activities, learning about nature and forests as they go. It’s a great opportunity for families to see the forests at their most breathtaking; from the magical colours of autumn through to the stark beauty of winter . The trails will be open daily during normal forest opening hours. The trail will be in the same format as the Gruffalo’s trail, so panels, character cut outs and activities for you to complete. 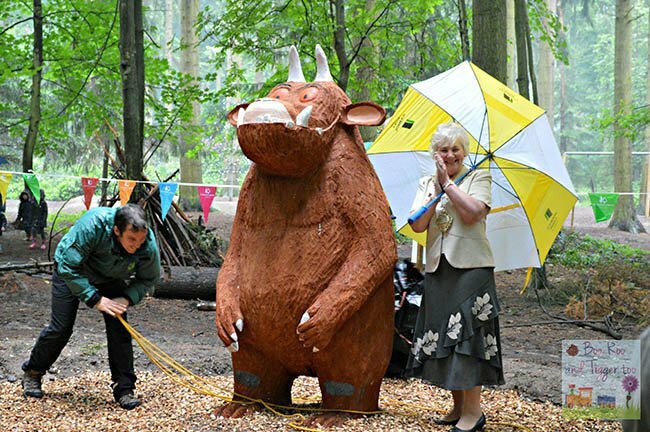 Gruffalo Trail Cannock Chase: The trail is open from the 20th February 2017. It is aimed at younger children, but the whole family can enjoy following clues and collecting evidence. Download the app before you visit and point it at the markers to bring the characters to life! You can find the start of the trail near the Go Ape cabin and it is about 1 mile in length. We went to the heritage centre to see the gruffalo and weren’t disappointed. Our 2 1/2 year old really enjoyed following the story and the wood carvings were really good. There was a fire and wood festival happening when we went which was also quite interesting. Where Are The Gruffalo Sculptures? We can’t give you exact locations (that would be telling! 😉 ) but we can tell you which fifteen lucky forests have been joined by the giant wooden Gruffalos! You’ll see him in different positions – the one at Wyre Forest is fast asleep! You can find a Gruffalo sculpture at each of the following forest locations.